art day! – animal crackers on the couch. after a quick trip (and $70!) to beverly’s lincoln, stella and i were ready to have the first of many art days. 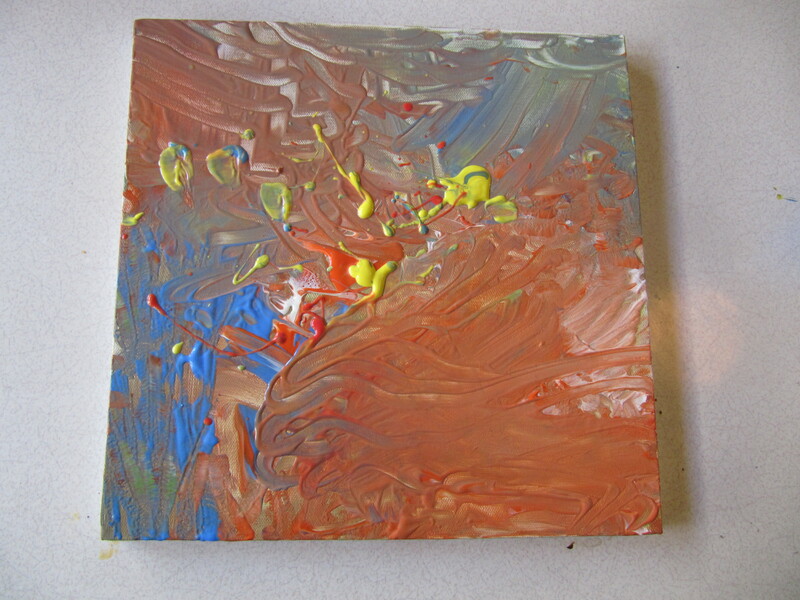 i wanted to introduce them not only to the texture and feel of paint, but of the wonderment of changing a blank canvas. lincoln at first seemed skeptical of my idea. i dipped his hand into the paint and tried to show him how to place it on the canvas. he was too disturbed by the feel of the paint on his hand to really enjoy what he was doing. i wiped his hands off and handed him a brush and then he went at it, banging and dragging it around the canvas. i poured some paint on another canvas and held it up to stella who promptly began hitting it with her hands and running her hands all around it. 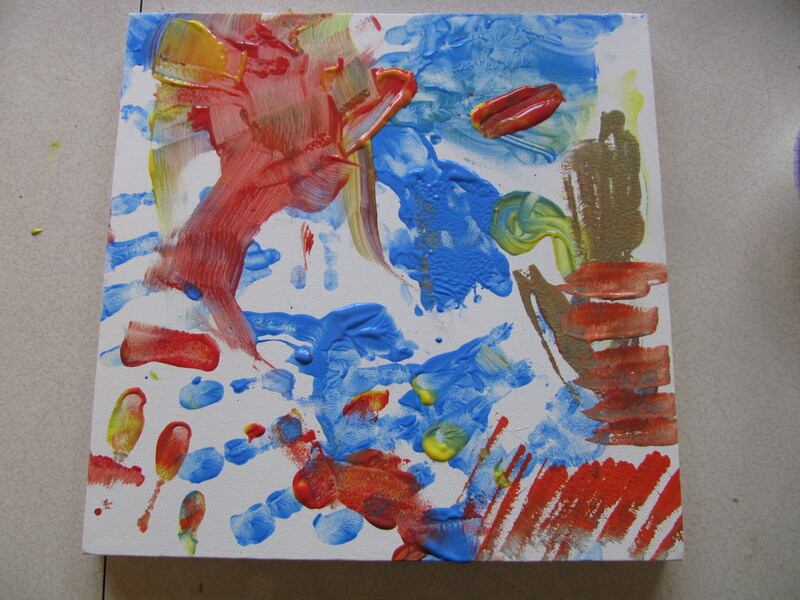 i tried to assist her in getting a foot print on it but she would just slide right off the canvas (it quickly became a 12×12 acrylic slip n slide) and soon she was covered in paint. i let her lay there and bang on it some more with her fists but when those little fists started to make their way into her mouth i decided to call art day to an end for her. she ended up in the kitchen sink, hosed off and wrapped in a towel. maybe it wasn’t the best activity for a 5 month old. but really who’s to say? there are books upon books of how to raise children (i know this for a fact, i’ve read most of them) there are ‘experts’ and advice givers. but having two kids has shown me one thing, every single kid is different. so an expert for one kid is a novice at another. that even holds true in the same family. lincoln was a totally different 5 month old than stella is. i am an expert at lincoln. i am a study in stella. i think the hardest part of being a parent (besides the constant worry) is the underlying feeling that you don’t know what you are doing. who knows, maybe it’s just me. maybe everyone else sails through it without an ounce of self-doubt. but i worry. about everything. if she sleeps in my bed will that create confidence or clingy-ness? if i get frustrated at bedtime and leave the room to let him cry is he going to think i abandoned him? is 5 months too young to lick up some non toxic paint? i recently had a spa technician tell me that babies that didn’t get an infant massage every night from their parents were bound to become drug addicts. i understood her underlying message, spend time with your kids, show them affection, and they will be okay. ignore them and you will deal with their issues later. i tell myself that my doubting and worry is proof that i am a good mom. i care enough to worry about my actions. but at the end of the day, after patting lincoln the appropriate amount so that he falls asleep. and after wrapping stella up and ignoring her so that she can fall asleep, without distracting herself by giggling at me, i know one thing for sure. i may not be the best mom, i may not write how-to-books. but i am their best mom. even with my faults and even if i let them eat paint a little too early, i am still exactly what they need. they are my blank canvases, and i am theirs. and yesterday as we sat, a trio covered in primary colors, with paint in our hair and in between our toes we discovered one thing: there is no right way to create a masterpiece. Posted on March 9, 2010 March 10, 2010 by stibbsfamily	This entry was posted in daily life, lincoln, stella, thoughts. Bookmark the permalink.